It's something you never think about until you need it. 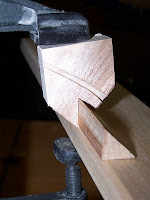 A method for clamping oddly shaped pieces when gluing. On large items, my strap clamps are more than adequate. Especially for oddly shaped picture frames and such. But for small items? A strap clamp won't work on the piece shown above. It's half of a "french cleat" that is only 1" high. Before, I would use blue tape. But I doubt the clamping pressure would be adequate for this job. I really needed to use my "F" clamps. But how? I cut a notch that matched the profile of the piece being clamped out of a bit of scrap. On the bandsaw this is a simple cut, but it makes a world of difference in getting a good clamp on the small piece of redwood. This project was just a simple shelf for the bathroom made from Lowe's redwood. 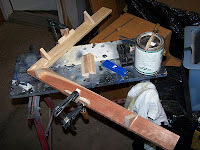 Pocket screws at the miter joint (screwed and glued), small triangles for braces also screwed and glued, and cleats on each leg. I was going to have to make a corner mounting block, but when one of the pocket screws proved to be too long and poked out of the wood in the corner, I realized I could take advantage of that mistake and use it as a corner brace. Not all mistakes are bad!